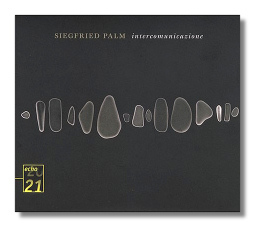 Recorded in 1969 and 1974, Siegfried Palm's CD seems almost anachronistic today. The avant garde of the 1950s and 60s is no longer particularly avant, and yesterday's rallying cries are today's history lessons. Daddy, what did you do in the war against tonality? Palm was the dedicatee of many of these works, and a champion of that era's new music in general. He really has no equivalent today – at least none so well known – and the cello repertoire is all the richer for his tastes and talents. One can't underestimate how much a sympathetic musician like Palm extends technique and notation skills as well. What used to be deemed impossible is now taught in conservatories. There's nothing about Palm's CD to reward casual listening. (You know you're a modernist when Anton Webern sounds like easy listening.) Each in different ways, these pieces are as demanding for the listener as they are for the performer, so don't plan on making Palm's CD part of your Friday afternoon drive-time. Taken a step at a time, the music here is excitingly thoughtful, brilliant, confrontational, mysterious, and just plan flat-out weird – full of glissandi, quarter tones, scratchiness, and physical assaults on the instrument of various kinds. It's also fun, if you don't take it too seriously, and that's how I recommend approaching this CD. I am sure the composers would disagree. I understand that none of this material has appeared on CD until now. DG deserves praise for bringing Palm's unconventional recital back into the catalog. The booklet notes by Martin Demmler could have been more detailed – one wants a more informative "Palm pilot," as it were – but they at least avoid jargon and musical politics. In-your-face engineering, but the cello's tone remains undistorted. Cornelius Cardew's music stands at the opposite pole from anything on Palm's CD. Here was a composer who, albeit once a disciple of Karlheinz Stockhausen, felt it unfortunate that concert music had become the domain of technicians and brainiacs. To redress that wrong, he formed the Scratch Orchestra, a motley assembly of musicians and non-musicians alike, who were given a role equal to the composer's in finalizing the work at hand: the seven-hour The Great Learning, whose text is based on one of the fundamental Confucian documents. Paragraph 2, "for an unlimited number of singers and drummers," is something akin to tribal chaos. For twenty-two minutes, voices and drums duke it out. The drums win. This "failure" (gradual disappearance) of the singers and the "success" (gradual synchronization) of the drummers is an essential aspect of the piece. Paragraph 7 is for singers alone. Cardew writes that it "is about the individual voice and the sound it makes in relation to other voices." The piece begins with the singers (again, not necessarily professionals) tightly grouped and singing a complex chord. As the piece progresses, the singers move away from each other and the complex chord is simplified. The result sounds like a 33-rpm record György Ligeti's Lux aeterna played at 16-rpm – that is to say, eerily beautiful. Cardew died in 1981, the victim of a hit-and-run driver. (Talk about chaos.) David Bedford (b. 1937), one year his junior, is still alive. His career has taken him from studies with Luigi Nono to collaborations with prog-rock master Mike Oldfield. His two choral poems stand in between Cardew's joyous and free-wheeling anarchy and the Cologne school's science and regimentation. Patchen's English texts are deconstructed for sound as much for meaning; there is no attempt to illustrate the nature imagery of these love poems. Again, Ligeti provides a point of reference. The Hamburg-based chorus performs these two poems beautifully, although the bass chorister's thick German accent at the end of the second poem provides a moment of unintentional levity. 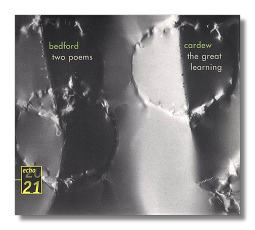 Cardew's 1971 recording has transferred well to CD, with open sound. The Bedford works, taped in 1968, are more claustrophobically recorded. Again, these appear to be CD premières.